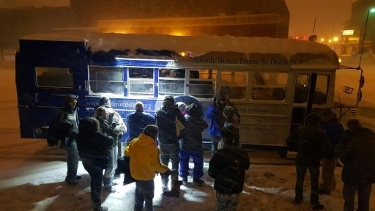 Sub Zero Mission needs a new delivery vehicle to help keep homeless warm. 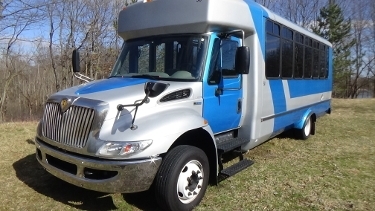 We started a Go fund Me Campaign in order to raise the amount we will need to replace our current delivery bus. You can donate here. Gemma has had enough of these kinds of nights. Gemma, the nickname we gave our bus, has served this mission well. Unfortunately over the last season she broke down during some key, long-distance runs. Twice this past season, the team was temporarily stranded because of a breakdown on long trips. If it weren’t for an off-handed remark made at a road-side restaurant during one of these breakdowns, the city of Buffalo would not have been serviced in January. The city of Pittsburgh did not get visited this year because Gemma would not start at all that weekend. This a version of what we are looking for. We have found a couple of styles that best fit our needs. (Like the pre-owned limo you see in the image to the right.) It will take little customization to make them ready for the road. You can find images of the people your donations help with our vehicle at this link . Please donate so we can continue to keep homeless warm.